Pins lay around my sewing machine as I stitch through a project and remove them before the needle passes over them with one easy pass of my hand. They pool in the small space between the machine and the edge of the table where I also keep the snippers, scissors, tweezers, and seam rippers for easy access. I sew quickly but I have to stop and use two hands to remove magnetized pins from my other tools. Yes, having a way to pick pins out of carpet is a good thing. I sew in a room without carpet, thank heavens. 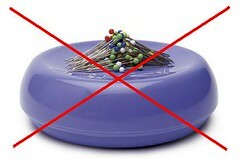 If I had carpet I would use a toilet brush dedicated to the sewing room to sweep the pins out of the carpet pile rather than return to having magnetized pins in my environment. Ah, the villains in action! Luckily (or not) I found 3 old pins that had escaped the clean out of The Stitchery so I could take this picture. 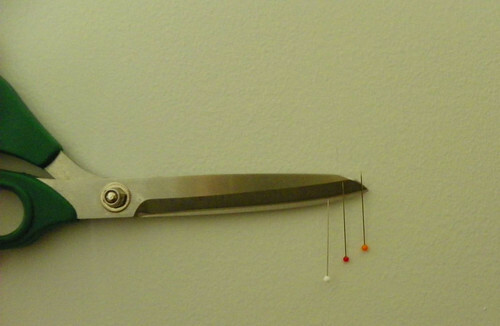 These scissors are not usable when covered in magnetized pins. I have tried using wooden boxes and pin cushions but I just get moving too fast and putting the pins into a special holder also takes up time. The wool wad accepts pins quickly and easily. Magnetized pins grab on to anything metal and enough of them can then realign the electrodes in the object so that it becomes magnetized. The cycle is endless and a conspiracy to steal my time. At 30 seconds per occurrence in a 6 hour sewing session that could add up to an extra 30 minutes a day. I haven’t timed the problem but I do want it to stop! And I’m hoping that all my metal tools can be demagnetized if necessary. Demagnetization is a pain and I haven’t been effective at it with my hand held magnets and piles of pins. 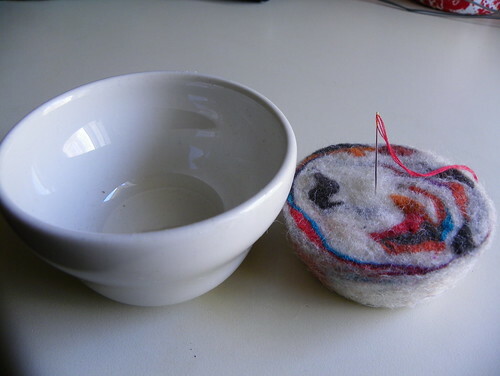 There are products you can buy to demagnetize things but I don’t want to add to my sewing clutter unless it is some fabulous fabric or gadget. Wiki Answers: How Do You Demagnetize An Object? Here’s my wool wad. 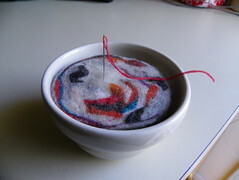 It has sat next to my button sewing machine, holding the special needles I needed for production. I found a heavy little ceramic dish to hold it at a restaurant equipment reseller when looking for paint booth mixing supplies. A heavy bowl is important to make this tool work well, I think. It was just happenstance that it fit so well. I’m sure there are other solutions to be found at Goodwill or second hand stores. You can buy Ewesful pin cushions directly from Ewesful or find them on ebay and Amazon. Pretty, eh? Love the psychedelic colors. Yeah. Posted in Sewing Space. Bookmark the permalink. Oh I LOVE the wool wad. I have the same frustrations with magnetized pins. Grrrr….. Talk about a total PITA. Yikes. I received one as a gift long ago, but never used it for a silly reason, so it is still in the box. This is a more practical reason!